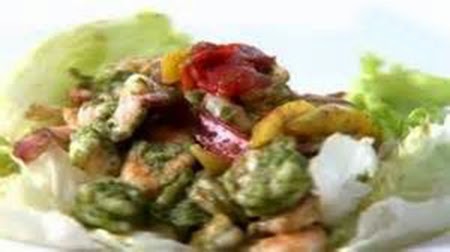 Marinate the prawns in coriander and mint chutney in a large bowl for 10-15 minutes. Quarter tomatoes, remove seeds and cut into thin strips. Cut raw mango into thin strips. Heat ½ tbsp olive oil in a non stick grill pan and the remaining in a non-stick pan. Tear lettuce leaves and place on a serving dish. Place prawns on grill pan and cook for 3-4 minutes. Add tomatoes and mango to the other pan. Add salt, black pepper powder, mustard sauce and sugar and toss. Add prawns to the mango mixture, mix well and cook for a minute. Transfer over the bed of lettuce leaves and serve immediately.